It’s no secret that many Hollywood films are retitled when they’re released in foreign territories. Sometimes, this is because there’s no literal translation for a title, other times it’s because the title might not make sense culturally. In the case of quirky cult comedy Napoleon Dynamite, the reasons for a name change in Japan were much more nefarious. Now, 20th Century Fox is rereleasing the film – along with an official apology for anyone duped all those years ago. As Kotaku’s Brian Ashcraft points out, Napoleon Dynamite, the story of kind-hearted oddball Napoleon, was rechristened Bus Man. Initially, you might assume this was just an odd translation, but it wasn’t. 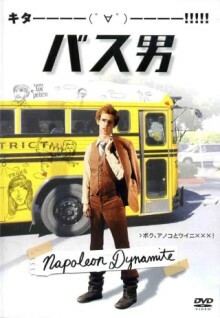 Instead, the Bus Man title was a calculated move to link Napoleon’s adventures to another popular Japanese film released earlier – a 2005 movie called Train Man. That film wound up being the 14th highest grossing film of the year in Japan, so marketing Napoleon Dynamite as a quasi sequel probably seemed like a pretty good idea, even though the two films are nothing alike. Hey, don’t feel too bad Fox execs – the Italian horror directors made this practice into an art form during the 1980s and they never apologized.